The Symfony Framework is a bit like a beautiful soup base. Made out of excellent ingredients only lightly processed by some great cooks, all under the supervison of one of the best chefs I have ever seen. And out of it you can make whatever soup you want. People love it. We're proud to announce that we now offer another ingredient that you can add to your Symfony-based soup by using ContentfulBundle for Symfony versions 2 and 3. 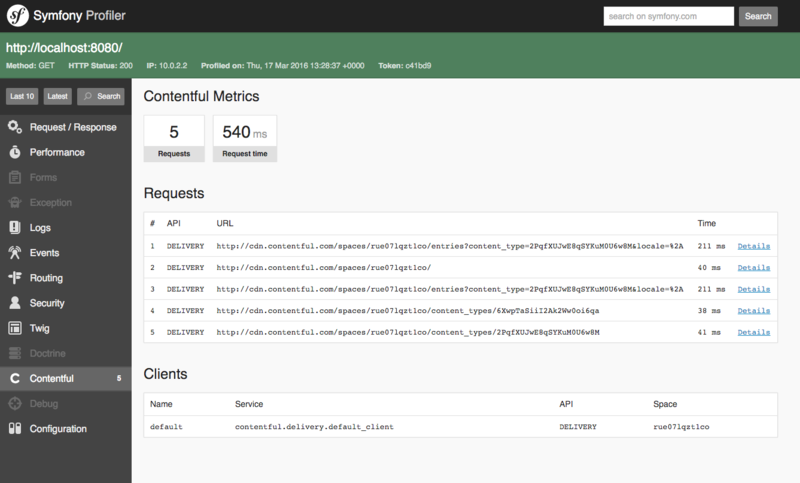 Besides an easy-to-use semantic configuration, the ContentfulBundle integrates with Symfony Web Profiler, allowing you to debug bugs and performance issues on the integration point between your application and Contentful. The ContentfulBundle requires at least PHP 5.5.9 and Symfony 2.7. PHP 7 and Symfony 3 are supported, too. To help you get started, we've created a tutorial and an implementation of our Product Catalogue example application. Just like the underlying PHP SDK the ContentfulBundle is currently in beta, and its API still might change. As always, if you find an issue or have any other feedback, please tweet at @contentful or open an issue on GitHub.